Being a parent is a huge responsibility as it plays a fundamental role in our child’s behavior, self-esteem, and confidence. So, of course naturally, you want to feel confident that your parenting is having a positive impact on your child and equipping them with all the tools necessary for future success and happiness. The main issue is that no one ever teaches us how to be good parents, and even though many of us see the benefits of investing time and energy in areas of our life we deem important, such as our health and careers, parenting is often never even considered. Yet, if you are anything like me, you will face many parenting stumbling blocks along the way. Well, like many, you will probably read countless online blogs and try tactics such as the “naughty step” and other gimmicks. But what if I told you there is a better solution? That allows you to grow and learn as a parent and navigate through some of the most difficult parenting obstacles? For me, Positive Parenting Solutions was the answer and in this post, I am going to take a deep dive into the program, what it offers and discuss the benefits as well as the drawbacks. Like the majority of parents, I get an incredible amount of fulfillment from my kids and our role as mom or dad is incredibly diverse and continues to evolve as our children grow. 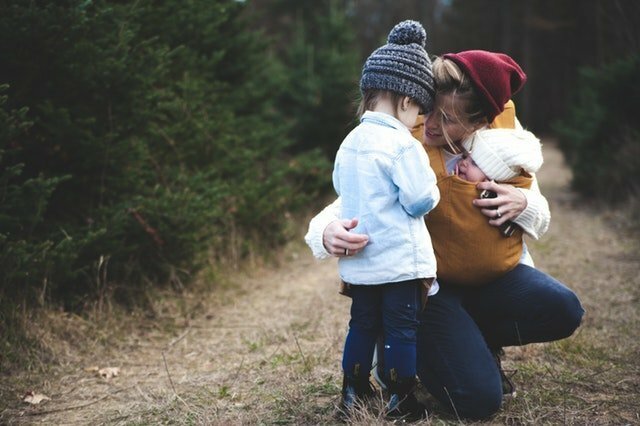 Everything from the basics of learning to walk and talk, to understanding how to manage finances are all heavily influenced by the type of parenting we receive. Yet sometimes parenting isn’t so easy or rewarding. In fact, it can be downright difficult. When our kids start to test our patience, misbehave and have temper tantrums, it can be extremely difficult for us to maintain our composure. Often, when we reach the breaking point, we start yelling at our kids and resort to punitive forms of punishment that just don’t work. I knew that yelling and scalding my kids wasn’t helpful, it was beginning to damage our relationship, impact my kid’s confidence and cause an enormous amount of guilt. These are the very reasons I began searching for a practical solution to improve and grow as a parent. 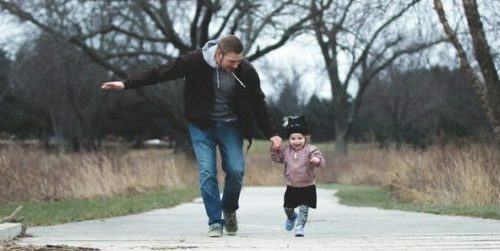 I began searching for ways to improve my parenting in every way: from discipline techniques, to how to correct poor behavior and the best ways to deal with difficult situations positively. I wanted to become a good parent and was willing to learn how to become one. If you can relate to many of the things you have read so far, trust me, you are not alone. In truth, there are parents from all walks of life experiencing these difficulties and even better – there’s a real solution. If I would recommend the program to other parents or not. Before we begin, here is a brief overview of Positive Parenting Solutions, including what is included and costs. The Positive Parenting Solutions Program is a complete step-by-step roadmap offered by parenting expert and TODAY show contributor Amy McCready. In the 7 part video series Amy explains why kids behave the way they do, how to understand that behavior and how parents can positively respond in a range of often difficult scenarios. The course begins with a parenting personality quiz, that allows you to identify how your personality may be impacting your parenting style. She also outlines why kids behave the way they do and the key drivers behind problematic and common behavioral issues. Amy then goes onto offer multiple tools and a video series you can follow on-demand. In the individual video lessons, Amy goes through common problems faced by parents and provides the techniques you can apply to maintain a peaceful household and happy kids, confident kids. 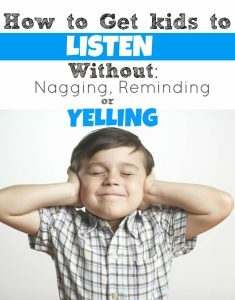 The program includes 49 in-depth video tutorials that address and show you how to deal with common issues such as kid’s not listening, talk back and sibling fighting. Each video is around 15-25 minutes in length and has accompanying scripts, so you know exactly how to respond to your child in the heat of the moment. More advanced training modules are also available and are designed to help guide you through very specific and common stumbling blocks. This includes everything from potty training, to bullying and ADHD. One of the most attractive features of the program is access to 1-to 1 live help from Amy herself, a private Facebook group (with over 15,000 members) and access to several years of coaching calls. All very useful extras where you can seek guidance as you implement your new parenting style. For example, Amy offers an “Ask Amy” call in session, where course members can submit their questions and then get them answered in a weekly webinar. As mentioned above, these “coaching calls” are all recorded and this archive is available to all Gold members, which is a superb tool to have when you may be facing difficulties. What Does the Positive Parenting Program Include? As well as the professional layout and appearance of the program, the content and what is included is extremely comprehensive. Amy has gone above and beyond to ensure her program isn’t just genuinely helpful but has gone the extra mile to make sure it’s user-friendly. So what does the program actually include? The primary module of the Positive Parenting Solutions is called “Learn the Tools”. It is comprised of seven video sessions that are designed to be watched in order. It covers all of the basic principles and foundation work you need to know in order to successfully use the tools Amy later discusses. One of the best parts about the program is that at the end of each session you actually feel like you have learned something you can easily put into action. Each video lesson is extremely well formatted and high quality and there is a series of complementary material with each one. That includes further reading, interviews and as previously mentioned accompanying scripts, so you know exactly how to respond to your child in the heat of the moment. After each session, Amy provides the first tool that you can place into your “parenting toolbox”. Each one is a practical way to deal with certain behaviors and scenarios and it is genuinely helpful. What’s also great is that Amy is a parent herself, so she understands the importance of maintaining a healthy and fun home environment and relationship with your kids. So, her approach is always about maintaining a positive, upbeat approach, which is great and lacking from many other books and parenting courses I have experienced. Another great part of the program is the workbook, which is beautifully designed and packed full of helpful info. Since it’s called “workbook” I just expected it to be a typical note taking pad of some sort, but it actually contains some really good information you can easily refer back to and it’s a great way to jog your memory when making any notes. The only drawback I saw with the workbook is the fact that it contains an awful lot of color. Naturally, this makes it look very nice, but for those that want to make print outs (which is recommended), it’s a bit costly in terms of ink usage. In total, it’s 93 pages and all have some type of background color. It’s important to note that every single module including the “Speciality Modules” and “Expert Series” come with their own unique workbooks, which are just as good. I found the workbooks offered a lot of value as a learner and it made the course much easier to understand, follow and refer back to any of the lessons I was taught. The regular part of the course is a great way to help a whole host of common parenting issues, such as discipline and behavior. But what about those issues that may be a little more specific in nature? Thankfully, the “Speciality Modules” and “Expert Series” includes 25 modules that take care of some very specific and important problems experienced by many parents. For example, if you have a child that is currently experiencing bullying, then there is a module that covers that topic. While if you have two children that are currently going through a lot of sibling rivalry and fighting, you would greatly benefit from the module called “Sibling Fighting”. These more precise modules allow parents to get to grips with the issues that are most crucial for your current situation. 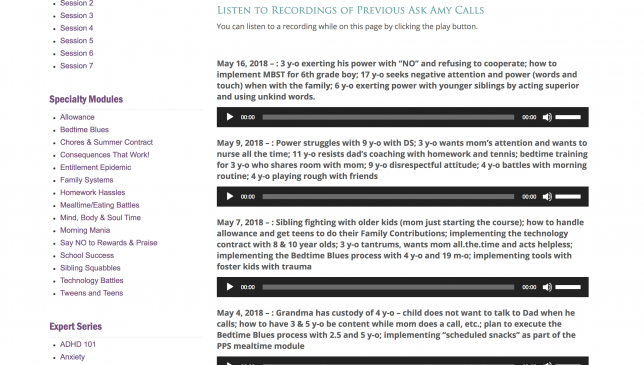 It’s worth remembering that Amy advises parents to complete session 1 to four of the “Learn the Tools” video series first. The reason for this is that these modules give you the foundation skills and the specialty and expert modules are providing further information, allowing you to essentially tailor what you learned earlier for certain scenarios. The Ask Amy Calls are calls you can request further help and advice by submitting your very own questions to her. All of these calls are recorded and then made available to other members. This is a great resource and contains many different calls addressing very specific pain points. 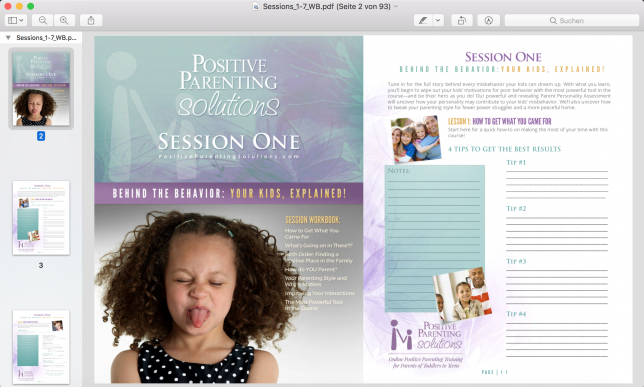 Positive Parenting Solutions offers three different types of memberships. The Gold Membership provides you with access to a Private Gold Member’s Facebook group where you can connect with other parents. Currently, the group has well over 15,000 members, all who share their concerns and who are also greatly motivated to become better parents. The group is a hive of activity and full of positive, like-minded individuals, so the learning process is made so much simpler. The Gold Membership also comes with a mobile app that you can download and install in your smartphone, giving you easy access, wherever you might be. You don’t even need access to the internet to use this app either, which is a great bonus. Even better, the app also enables you to download each videos audio track to your device. This means you can easily catch up and listen to program when you are traveling, whether that is commuting or driving in the car. The fact that you don’t need internet access is a great advantage as it means you don’t need to use your devices internet data or rely on your internet connections signal strength hanging in there. 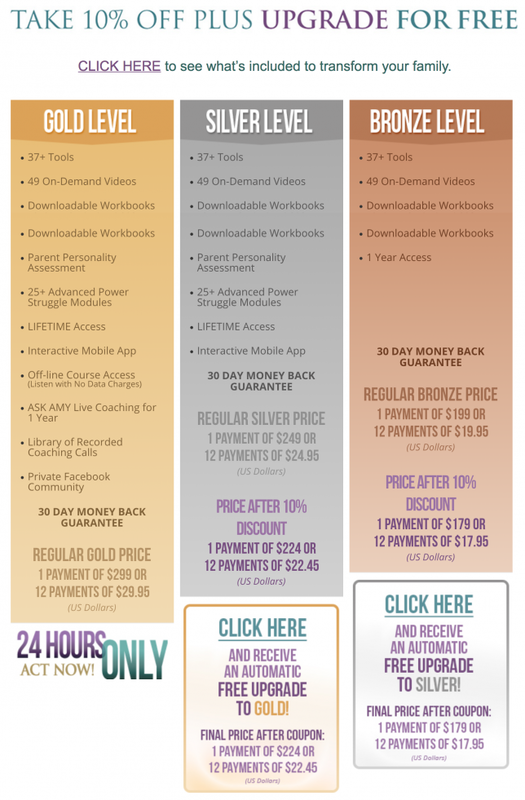 How Much Does Positive Parenting Solutions Cost? So now you know what is included in the program, let’s discuss the cost of the different types of membership available. In total, there are three different levels of membership: Bronze, Silver, and Gold. As you may have gathered Bronze membership is limited in that it provides you with a single years access, while Silver and Gold provide you with lifetime access to the program. It’s certainly worth noting that you are able to upgrade at a later date, should you choose either Bronze or Silver membership when you first sign up.